Hundreds of jobs and local economies are at stake as regulations, other challenges mount. In a region that has yet to recover from the recession, Arizona G&T Cooperatives is a stabilizing and vital part of the regional economy that supports jobs beyond its fences and creates hundreds of millions of dollars in tax revenue and other revenue streams. That’s the conclusion reached in a recent study by Dr. Robert Carreira with the U.S. Center for Economic Research (www.useconomicresearch.com). He discussed the importance of the cooperative utility, which owns and operates the Apache Generating Station at Cochise, Arizona, during an annual presentation on local economies in Benson, Arizona. AzGT also owns more than 620 miles of high-voltage transmission lines and 27 substations, and employs 234 people. “The Cochise County economy has been in recession for five years and we’re still struggling, so to have such a large employer with the types of jobs a utility provides is extremely important,” Carreira said. Dr. Robert Carreira discusses the regional economy during a presentation in Benson. 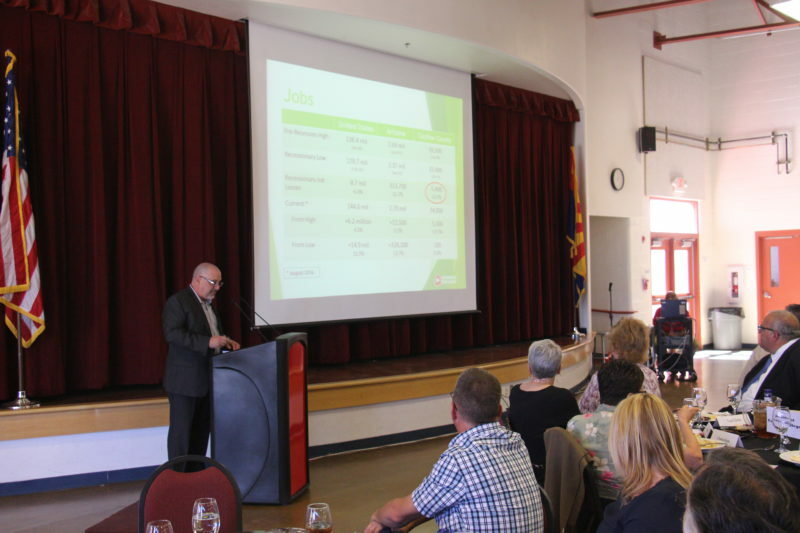 Carreira, who said the area is still struggling from the recession, called the economic contributions of Arizona G&T Cooperatives “the bright spot” in an otherwise economically-depressed area. “The fact that (the G&Ts) is keeping its numbers up, has a stable workforce and is even doing some hiring, it really is one of the few bright spots in the regional economy, especially as the rest of the economy has been struggling,” Carreira said. Conversely, the increasing legislative and regulatory challenges like the U.S. Environmental Protection Agency’s Clean Power Plan (CPP) threaten to devastate entire communities if even a portion of the plant is shuttered. Ironically, because of its relatively small size, and because it already complies with stringent emissions limitations, completely closing the plant because of the CPP would have almost no effect in reducing carbon emissions in Arizona. The only sure result of the CPP will be higher electric rates. “When it’s all said and done, what we’re left with is folks paying more money for electricity, and that means they have less money to spend for other things, and that threatens the businesses throughout the county and the region,” Carreira said. “Take that money out of the economy to pay for higher electric rates, small businesses have to close their doors and you’re going to feel that impact as people lose their jobs when these small businesses can’t afford to stay open,” Carreira said. “Arizona G&T Cooperatives adds a lot of stability to the economy,” Carreira said. Each job at Arizona G&T Cooperatives creates an additional 1.4 jobs in the regional economy. $1.3 million in property tax revenue to special districts (community college, hospital, fire, flood, library, and joint technical education).